Garlic is a member of the onion (Allium) family, and is used (in fresh or dried form) as a source of characteristic sulphur containing chemical compounds (e.g. allicin, which is responsible for the odour of garlic), that have various actions within the body. Some of these compounds are present in garlic in a latent form, which are activated when garlic cloves are crushed or digested. Bio-Garlic is a formulation containing garlic powder dried in a special way to preserve the activity of these latent chemical compounds (particularly alliin and allinase) prior to their activation within the body. When garlic is crushed or digested within the intestinal tract, the sulphur containing amino acid derivative alliin is converted by the enzyme allinase (also present in garlic) into allicin, which is the most important of the active substances present in garlic. The activity of the enzyme allinase is reduced by heat, hence the physiological effects of cooked garlic are reduced. The active compounds in Pharma Nord Bio Garlic help maintain healthy blood lipid profiles; total cholesterol levels are reduced by approximately 10% (by mediating cholesterol synthesis in the liver), with a 15% increase in HDL cholesterol and 15% reduction in LDL cholesterol. Garlic derived compounds also help maintain healthy cardiovascular function, in particular blood pressure, platelet adhesiveness, and clotting. Garlic derived compounds have anti-microbial activity which helps maintain healthy immune function. 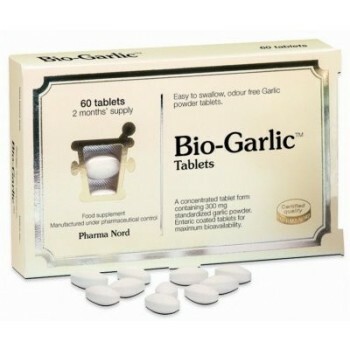 Pharma Nord Bio Garlic is one of the best garlic supplements available. How much garlic should you take? The generally recommended intake for garlic is 400-600mg dried garlic powder/day (equivalent to a daily dose of 4000mg of fresh garlic). This equates to a daily intake of 4000 microgm/day of allicin potential. Are there adverse effects from taking Pharma Nord Bio Garlic? Garlic is generally well tolerated, with mild gastrointestinal disturbance or skin rash being occasionally reported. Clinical and animal studies have shown the toxicity of garlic to be very low. Garlic may interfere with the action of anti-coagulant and anti-hypertensive drugs. Each tablet of Pharma-Nord Bio-Garlic contains 300mg of dried garlic powder, providing 4.5mg of alliin (2.1mg allicin equivalent). Tablets are entero-coated to ensure passage through the stomach and dissolution in the intestine, enabling maximum bioavailability of the active garlic principals within the body. Pharma-Nord recommends 1 table/day. Bio-Garlic is manufactured under Danish pharmaceutical control.